This is a great book about the greatest race horse ever. It is told from the point of view of a boy named Danny who was with Man o' War through his whole life. It is my Favorite book EVER!!! Danny, the stable boy, is a fictional character. This is a book by Walter Farley (1983) edition. When I read it, I JUST LOVED IT! It Is a wonderful book! 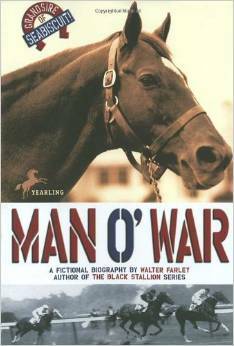 It is about Man o' War, the greatest race horse of all time told by a stable boy.